The team teased the latest trailer yesterday but we weren't quite sure what kind of video we'd get. And yes, as in all games now, there will be a Battle Royale mode. Call of Duty: Black Ops IIII is also set to implement a battle royale game mode, named Blackout, so it looks like the old rivalry between CoD and Battlefield will turn into the current Fortnite v PUBG. We'll be at Gamescom next week going hands-on with Battlefield 5, and we'll hopefully get to try out the battle royale mode as well. We could be looking at the start of EA's big awareness and marketing push for Battlefield 5, which hasn't really been present thus far. As a reminder, the franchise of DICE will return to the sources, 16 years after the release of Battlefield 1942, since this fifth installment of the saga will focus on the war 39-45. Battlefield V will release on October 11th! The trailer features thrilling, never before seen gameplay footage of the new Rotterdam map, which immerses players in a battle fought throughout the streets of Holland, where the Germans attempted to seize the Dutch city. The trailer, which claims to be all in-game footage, is a montage of intense gameplay that runs the full gamut of Battlefield V's various concepts. In new and classic multiplayer modes, players can lead their own unique Company to victory in a dynamic multiplayer experience where every battle is unique. 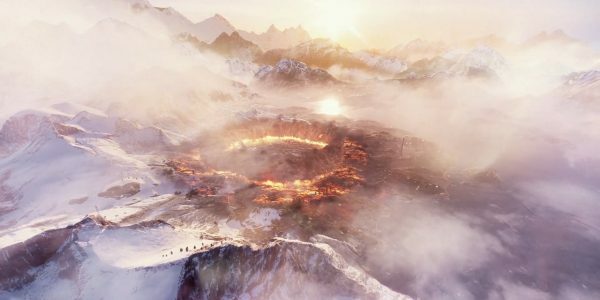 The closing moments of the new Battlefield 5 trailer show a burning ring of fire and smoke, closing in on soldiers. Battlefield V will be heading to Xbox One, PlayStation 4 and PC on 19th October.